Item Lore: Extracted from the brainstem of dragons and their kin. Thanks. Added recipe. Are you playing on a TLP server? Foraged on 19-AUG-12 Still has tradeskill tag. As of 05-AUG-16 it still has a TS tag. We volunteer admins cannot change any of that information. Only the item collector can update that. And the item collector of course needs work done to it by someone at ZAM. We've had some programmers recently interested in fixing the item collector so hopefully we'll see this item, among many other items fixed "soon". 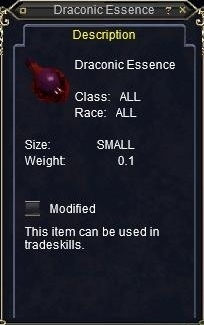 No longer indicates that it is a tradeskill item. EQTC says "no known recipes". Druid in our group foraged one of these tonight while doing Grounding the Drakes. Click your "Accept" key...and then put it in the HOT BUTTONS in a slot you normally don't use - I use #1. Go play NASCAR...evertime you move left...you'll autoforage. You're merchants will love you. You be da man (or elf, dwarf, or whatever)! Knew I'd seen somewhere you could do this but never found how...many MANY thanks friend, I owe you! Have foraged over 1000 times and have only seen ONE of these. Have only seen one other in the bazaar on Saryrn and it was up for 1000pp. How exactly do you set up your Forage Macro??? the more details the better. My druid foraged this in Lavaspinner's Lair at the zone in from Bloodfields. It is used in several alchemy potions, but buy them all the time for 10pp to 25pp. These seem to be a pretty rare forage, but i've been selling them at about 500pp each to shamans to make those great spell-effect potions.